Five members of Turkey’s ruling party who visited exile cleric Fethullah Gülen in Pennsylvania in 2012 were re-elected in Sunday’s parliamentary elections, opposition newspaper Cumhuriyet said. The five were part of a 12-member delegation of parliamentarians who went to see the former government ally, later accused by Turkey of orchestrating the 2016 coup. Gülen, self-exiled Turkish cleric based in Pennsylvania, denies the accusations. Of the 12, five were put up for re-election by President Recep Tayyip Erdoğan’s Justice and Development Party (AKP), one is believed to have fled overseas, and one has been made the head of a state-owned enterprise. Gülen’s followers inside the military were among those instrumental in the attempt to overthrow the government in which more than 200 people were killed. Since then 160,000 people have been arrested and 152,000 civil servants dismissed from their jobs as suspected members of the secretive Islamist movement. Many conservative Turks who bought the wrong daily newspaper, sent their children to the wrong cram school or opened an account with the wrong bank have been swept up in the crackdown and lost their incomes or their liberty in the purges. While Turkey's critical media has been highlighting the story and accusing the government for hypocrisy, pro-government media has been burying it. 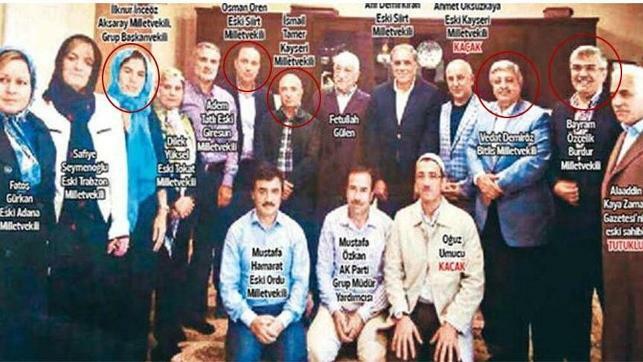 Pensilvanya’ya gidip Fetullah Gülen ile fotoğraf çektiren 12 AKP Milletvekilinden, aday gösterilen 5 isim yeniden milletvekili seçildi. Aksaray Milletvekili İlknur İnceöz, Aksaray’dan, AKP Burdur Milletvekili Bayram Özçelik Burdur’dan, AKP Siirt eski Milletvekili Osman Ören, Siirt'ten milletvekili oldu. AKP Genel Başkan Yardımcısı ve Bitlis Milletvekili Vedat Demiröz ise İstanbul milletvekili seçildi. Kayseri Milletvekili İsmail Tamer de aynı ilden vekil oldu.